Last week marked the centennial of the end of the Great War, a conflict fought on such a large scale that it was considered to be the War to End All Wars. Yet in a period of 20 years the world was once again engulfed in a far more destructive war. What would become known as World War One marked the beginning of industrialized warfare. The era of the horse was replaced with the machine, in the form of powered aircraft (the biplane and the zeppelin) and the tank. Heroic élan was mowed down by infantry column via the rapid fire bursts of the water-cooled machine guns across the shell-pockmarked No Man’s Lands throughout Belgium and northeastern France. The war gave birth to new borders and new nations. And from a geopolitical standpoint, gave birth to the United States as a world power. Upon arriving in Paris, General John Pershing, commander of the American Expeditionary Force, visited the grave of the legendary Marquis de Lafayette in Picpus Cemetery on the Fourth of July in 1917, with his aide announcing to the Revolutionary War hero that the Americans were here. Just as the united colonies’ victory in the war that created our nation would have been improbable without the assistance of Bourbon France, the defeat of Imperial Germany would have been unlikely without the intervention of the United States. America was there to not only make the world safe for democracy (and protect its transatlantic shipping) but to return the favor. Of the estimated 2,000,000 Americans who embarked for Europe, over 116,000 “doughboys” would die in either combat or from disease- that number being larger than the combined US fatalities in the Revolution, War of 1812, Mexican-American War, and Spanish-American War. Whatever debt the United States had to the Old World had been paid in full, though we would go back to France once again not as defenders but liberators while incurring a much higher cost. Since 1917 the three principal allies from World War I United States, the United Kingdom, and France formed a phalanx against Nazi aggression and then later held the line (along with former enemies and neutrals who realized that evil did not adhere to their national noninterventionist posture) against the Bolsheviks. 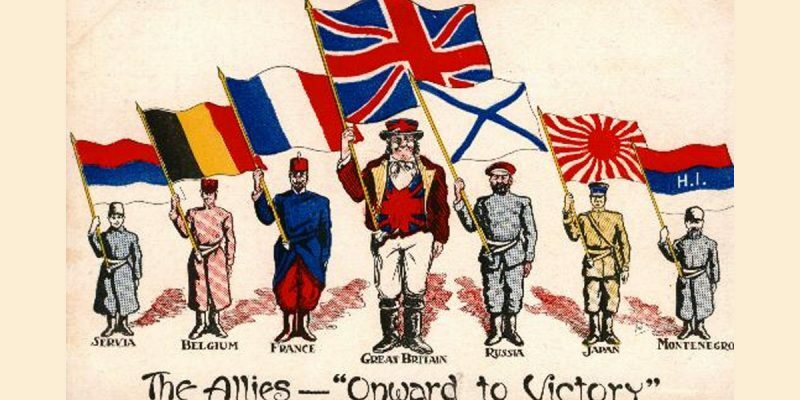 Considering that one of our partners was our first national ally and the other was our mother country, you’d think that the bond between the Big 3 of the West would be solid at the commemoration of the centennial of the triumph of their alliance. French President Emmanuel Macron was having none of it. Leading up to the 100th anniversary of World War One’s conclusion, Macron delivered a speech where he mashed up multiple issues (reemerging authoritarian powers, cyber security, and the US pull out of a missile treaty) to call for a true European army and the need to protect the continent from Russia, China (! ), and….wait for it….the United States(?). Of course Macron would later backpedal, claiming he meant no offense to the nation that saved his country twice and that his words were misinterpreted. Time magazine ran a recording of his speech with a text translation and contrary to Macron’s attempt to explain the controversy away the insult the United States and probably President Trump specifically was clear. The French leader’s words were no better received in London and Berlin than they were in Washington, as the British and Germans are less concerned with reclaiming their once preeminent world standing than maintaining an alliance that has peacefully secured Western Europe since Hitler’s final act in the bunker scene. Perhaps Macron should visit the immense sarcophagus under Les Invalides dome and contemplate how things ultimately played out for the French emperor who temporarily occupied a swath of territory from Portugal to the Kremlin. And from there, Macron should walk to the adjacent museum to see how a foreign policy born out of pettiness and retribution led to a jubilant German fuhrer motoring about Paris, playing tourist in occupied France. The true lesson to be learned from World War One isn’t how it came about but rather how it resulted in a far more terrible war two decades later. While the Allied generals and soldiers won the war through force of arms and a steady supply line, the Allied politicians and diplomats simultaneously lost the peace and the lives of millions of people not yet born. To put the blame for the most recent era of bad feeling between the United States and Europe on Trump’s shoulders would not be fair. As history has taught us, the leading powers of Europe, especially France, are more than willing and able to provoke conflict without our help.